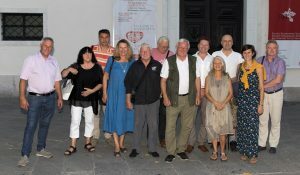 The three day long event – the 8th International Vintage of Travel Journalists – was carried out with the support of the of the leading Slovenian winegrower Marinko Rodica from the village Truške near Marizige in the Slovenian Istria and Jana Tolja, Mayor`s Adviser at Municipalty of Koper. Apart from travel journalists from Slovenia nine journalist from Slovakia, Czech Republik, Serbia, Croatia and Italy took part. 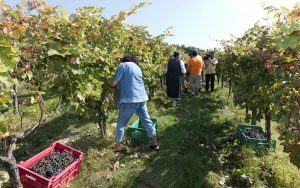 The vintage was carried out at family Organic wine farm Rodica, located in the heart of Slovenian Istria, in the village of Truške near the town of Koper. Apart from the international vintage a very special vintage was organized: on April, 10 2015 in front of the wine cellar of Marinko Rodica members of association Travel Press Slovenia planted a vine of refosco, which in this year for the first time cropped heavily and for the first from “our vine”, as we call it, we collected grapes. 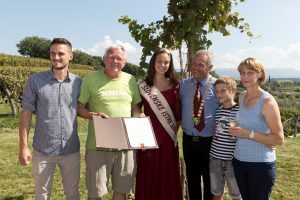 The Association Travel Press Slovenia on this occasion presented to Marinko Rodica the award of Honorary Member, for being long years long well-disposed to the association and its activities. With this award the association expressed its thanks also to his family – his wife Suzana and the three sons Matic, Aleš and Rok – for the warm reception Slovenian Travel Journalists always have received by all its members.